Anna Hazare, one of the most admired and supported social activist of India, who contributed his whole life for the betterment of a nation. His birth name is Kisan Baburao Hazare. He was born in a unskilled labourers family, in Bhingar village of Ahmednagar district, Maharashtra. Anna was raised by his aunt in Mumbai, who did not have any child of her own. He was dropped out of school after seventh grade because of financial problem. Anna started selling flowers at railway station. His hard work paid off and he ended up having two flower shops of his own. In 1962 because of Indo – China war, Government of India appealed Indian youth to join Army. In response to appeal, he joined army as a truck driver in 1963. Anna was frustrated with his life. He did not find any purpose of his life. He thought to commit suicide many times. In 1965, he was posted at Khemkaran border. Pakistan launched an attack on his post, and killed all his mates. He was the lone survivor of that bomb attack. That was the turning point of his life. He felt there must be some reason that he did not die. He started reading books of Swami Vivekananda. His preaching gave a new meaning to his life. At age of 26 he pledged to be a bachelor and dedicate his life in service of humanity. In 1975, after his 15 years of service in Army, Hazare took voluntary retirement and returned to his native village Ralegan Siddhi. He was shattered to see the miserable condition of his village due to water scarcity, unemployment and alcoholism. The social activist organised a group of like minded people and named that ‘Tarun Mandal’ or Youth Association. Mandal started water harvesting project in village and motivated villagers to conserve every drop of water and engage themselves in less water demanding crops. Baburao Hazare introduced Grain Bank in village. Where farmers with surplus grains could donate and one in need could borrow the grains and return the same with interest when he could. He established temple and school in village and abandoned all the liquor dens. All the villagers got employment because of him. Anna’s hard work resulted in overall development of Model village based on sustainable development. In 1990, Government of India awarded Anna with Padma Shri (fourth highest civilian award of India) for establishing Model village for others. In 1991, the social activist started campaign named ‘Bhrashtachar Virodhi Jan Andolan’ against corruption. He provided evidence against 42 corrupted forest officers. His campaign resulted in suspension of 400 government officers and forced 6 ministers to resign. In 1992, Anna Hazare was awarded with Padma Bhushan (third highest civilian award) by Government of India. 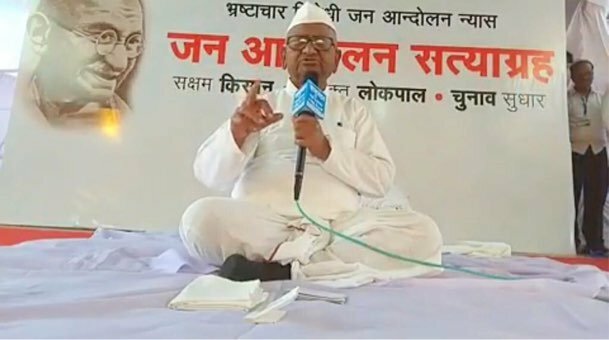 Anna Hazare went on indefinite hunger strike in 2003 for Right to Information in Maharashtra. He travelled over country to spread awareness about RTI. After 12 days of his strike, president signed the bill and ordered the state government to implement RTI. Later RTI act was enacted all over India in 2005. In 2007, Anna Hazare opposed liquor from food grains policy of government and fasted for 5 days. In 2011, the activist started Satyagraha movement for Anti Corruption Jan Lokpal Bill which would allow to investigate top officials. He went on hunger strike, his non voilent means of protest attracted great amount of youth in his support. People like Kiran Bedi, Arvind Kejriwal, Prashant Bhushan and Kumar Vishwas joined this campaign. The bill was later passed in 2013. Since 23 March 2018 to till date, Anna Hazare is fasting for indefinite time at Ramlila Maidan, New Delhi. This time, his demand is to appoint a Lokpal at centre and lokayuktas at state and to provide better Minimum Support Price (MSP) to farmers. A Marathi film named ‘Mala Anna Vhaychay’ was made based on Anna Hazare’s life. Actor Arun Nalawade played his role. Bollywood also made film called ‘Anna’ based on his life. Shashank Udapukar played his role in film. Kisan Baburao Hazare received numerous awards worth ₹25 lakhs and he donated the entire amount. He appeals to public wherever he goes, he runs his campaigns with public support, without any sponsorship. It’s been 35 years that he did not go to his home because he is busy to serve the society. He is a live example of patience, sacrifice and patriotism.